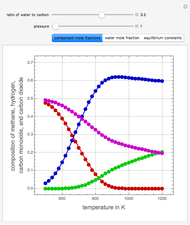 Assuming that the heat of reaction is independent of temperature, the equilibrium constants of the three reactions versus temperature are calculated and plotted (blue, red, and green for reactions , respectively). 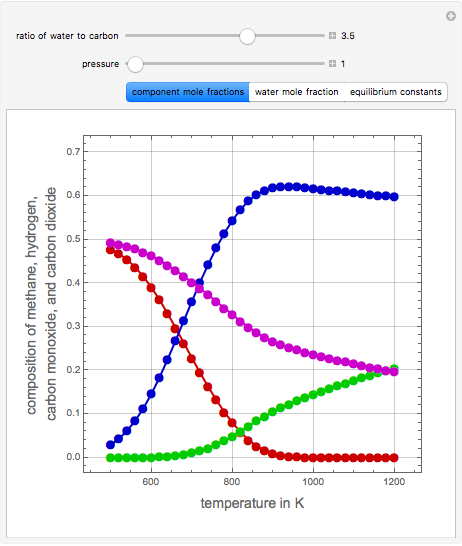 It is clear from the trend of these curves that reactions (1) and (2) are endothermic but reaction (3) is exothermic (i.e., for reaction (3) decreases as increases). 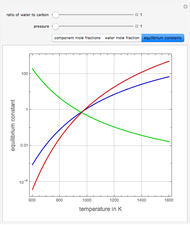 Also, the equilibrium constant for reaction (2) is larger than for reaction (1) at higher temperatures. Thus, one expects methane, water, and carbon dioxide to be depleted at higher temperatures in favor of carbon monoxide and hydrogen. Also, a higher molar ratio of water to carbon shifts reaction (1) to the product side, with more carbon dioxide being formed. 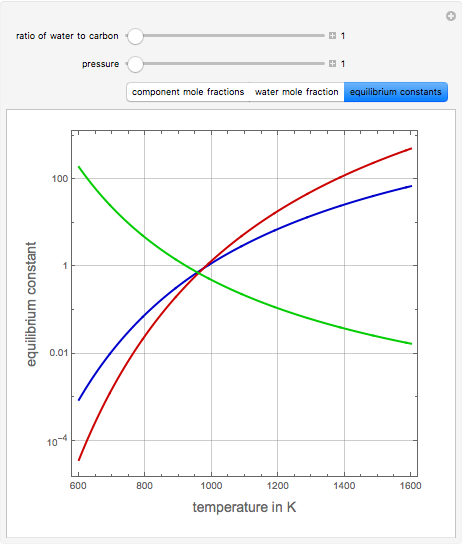 The number of moles of all components can be found by minimizing the Gibbs free energy of the mixture, for user-set values of and . 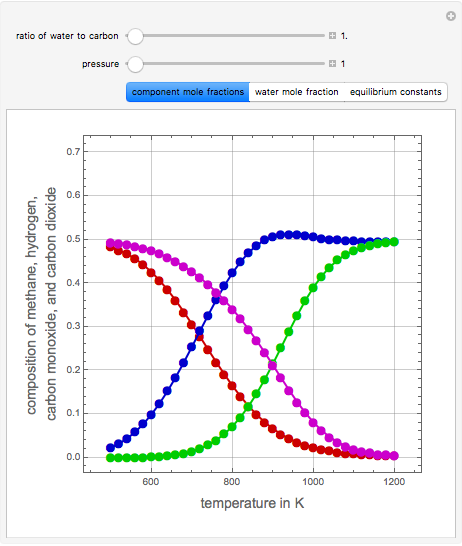 The results of this minimization procedure can be plotted as equilibrium mole fractions of the species other than water (methane, carbon monoxide, hydrogen, and carbon dioxide, shown in red, green, blue, and magenta, respectively). 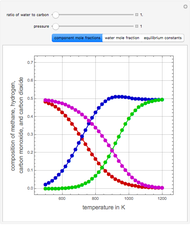 The mole fraction of water is plotted separately, in orange. S. I. Sandler, Chemical and Engineering Thermodynamics, 3rd ed., New York: John Wiley & Sons, 1999. Housam Binous, Ahmed Bellagi, Brian G. Higgins, Ahmed Aheed, and Mohammad Mozahar Hossain "Production of Syngas Using Coal-Steam Reactions"